LEFT: A right-side view of the skull of Protosphyraena nitida, an extinct swordfish-like fish from the Late Cretaceous Smoky Hill Chalk. Click here to go to the Protosphyraena webpage. While a name like "Oceans of Kansas Paleontology" may seem a little unusual since Kansas is about as far away as you get from an ocean, the whole Midwest region of North America, from the Arctic Circle to the Gulf of Mexico, has actually been underwater for far longer than it has been above it. It has only been in the last 65 million years or so that Kansas has been above sea level and relatively dry. The major continental uplift that created the Rocky Mountains also raised what is now the Plains States half a mile or more from what had been the floor of a shallow inland sea. I put Oceans of Kansas Paleontology on the Internet in December of 1996, largely because I could not find this kind of information anywhere on the Web. After learning enough HTML code to become dangerous, I put the first few pages up on the web and created the beginnings of a monster web site that has grown steadily ever since. 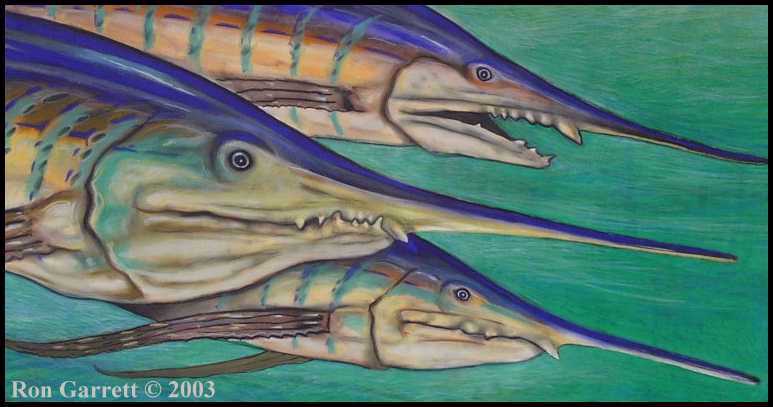 As of January, 2008, after more than 11 years on the Internet, Oceans of Kansas Paleontology has over 250 pages up and running... and continues to grow. The idea for the first book came about as the result of a number of requests that I received from people who had enjoyed the website and wanted to buy the book... Of course, there wasn't any book at that time, but I started thinking about it. When I approached the Indiana University Press about idea, they were very enthusiastic.... so here we are, 20 months later and almost 6000 books sold! 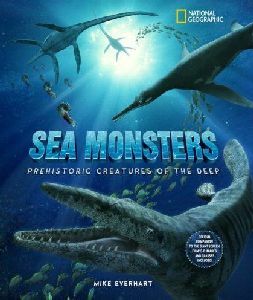 After that, National Geographic needed a book to go along with the IMAX 3-D movie called Sea Monsters. I was fortunate enough to be one of the science advisers on the movie and also got to write the book! 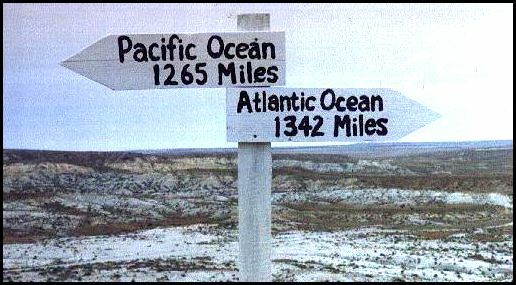 LEFT: OCEANS OF KANSAS - A Natural History of the Western Interior Sea. by Michael J. Everhart, published June, 2005 by the Indiana University Press ISBN: 0253345472 "A journey to a time when sea monsters roamed the middle of America"
The Smoky Hill Chalk Formation that is exposed in Western Kansas has been the source of some of the best Cretaceous marine fossils that have been found anywhere in the world, It has been extensively collected for almost 130 years, starting with the the late 1860s work of Professor B. F. Mudge, and the discoveries of Professor Marsh's Yale College Expeditions in 1870. Even after millions of years of uplift and erosion, there are still thousands of feet of marine sediments (shale, chalk, limestone, sandstone) under the soils of the State. The oldest of these sedimentary rocks (found in extreme southeast Kansas) date back almost half a BILLION years to the Mississippian Period. Most of the Kansas fossils that we work with are from the Smoky Hill Chalk and Pierre Shale. They are the remains of extinct animals that lived in the Late Cretaceous Period (87-75 million years ago), and were buried at the bottom of in a shallow marine (salt water) sea. See our latest Permian Shark discovery HERE ... over 280 million years old! from a different ocean that once covered Kansas. 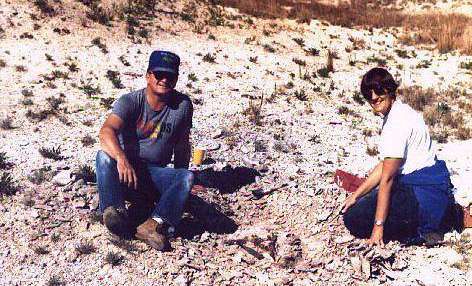 Mike and Pam Everhart at the site of Pam's 1988 discovery of the skull of a large, late Cretaceous fish called Protosphyraena nitida. Protosphyraena was a primitive predatory fish that looked something like a modern swordfish, but the vertebrae and ribs are poorly ossified and rarely are preserved as fossils. They do have a distinctive bone at the base of the tail (caudal fin) called the hypural. 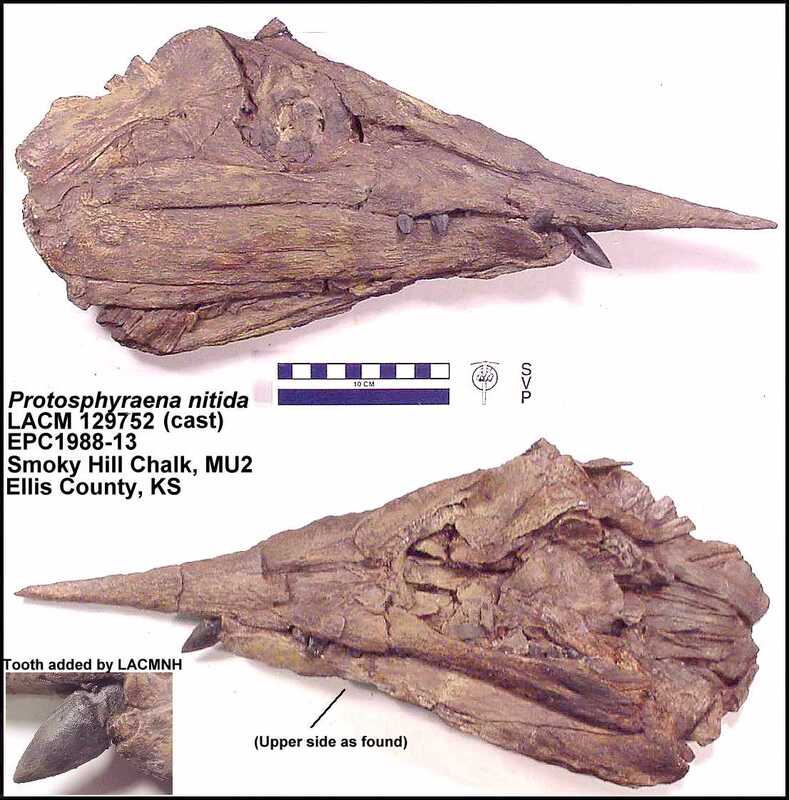 To date, this is the only known specimen of Protosphyraena which has the pectoral fins preserved with a complete skull. 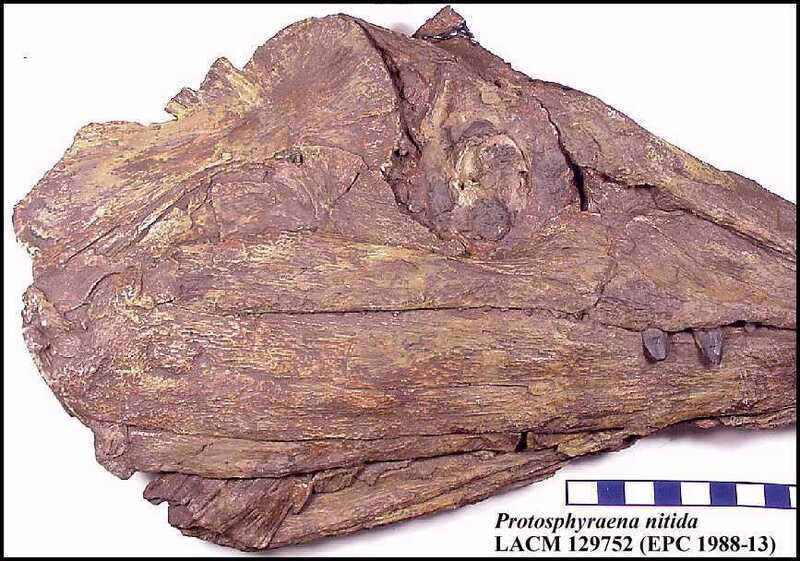 The specimen was donated to the Los Angeles County Museum of Natural History and a picture of the right side of the prepared skull was published in the LACMNH Magazine, TERRA, in 1993 (Vol. 31, Number 4). A cast of the skull was last seen in the Denver Museum of Natural History, in the Ray Troll traveling exhibit. Pictures of a cast of the LACM 129752 skull are HERE and HERE. 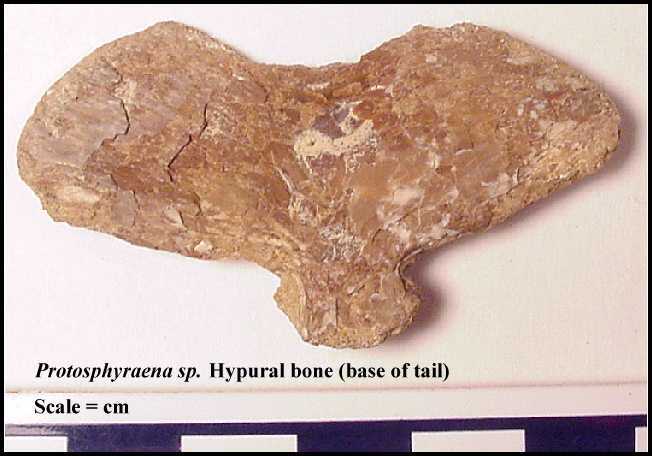 See our Protosphyraena page HERE. 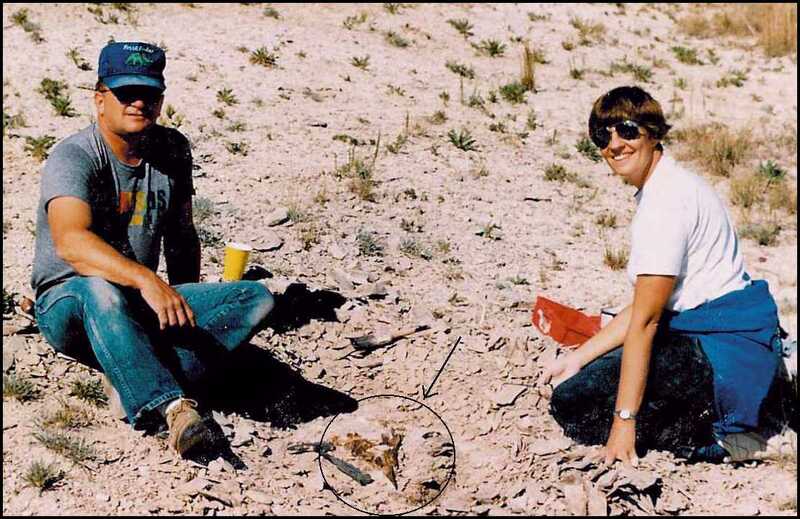 Mike and Pam Everhart collect fossils from the Late Cretaceous Smoky Hill Chalk Member (Niobrara Formation) and Pierre Shale of western Kansas. Mike was appointed (8/98) as an Adjunct Curator of Paleontology at the Sternberg Museum of Natural History, Fort Hays State University, Hays, Kansas and is an active member of the Society of Vertebrate Paleontology. He is also the President (2005) of the Kansas Academy of Science, and has organized the Paleontology Symposium at the last seven annual meetings of the KAS. He is now the editor of the Transactions of the Kansas Academy of Science, a 135+ year old scientific journal. We have been collecting fossils in the Smoky Hill chalk for almost 20 years and have donated several unique and interesting specimens to museums across the United States. In addition, Mike writes papers, leads field trips, gives school talks, runs this webpage, and works with paleontologists from around the world. Although we collect all kinds of marine fossils from the Smoky Hill chalk, we are particularly interested in large marine reptiles called mosasaurs and plesiosaurs. Much of the information presented on this web site is about these fascinating animals and their connections to other marine life of the time.